My thoughts that I would like to share with you today is that I would like to challenge the idea that creatives are just right brained, or “even right-brain dominant” as some would suggest. For many years I accepted this myself. I often humorously use it as an excuse for why I’m not great at math. But here’s the thing, as graphic designers, we don’t have the luxury of being only right brained. Even though people who are creative consider themselves right brained, much of the left brain really goes into so much of what we do. Of the creative professions, designers consistently use (or should use) their left hemisphere as much as, if not more than the right. 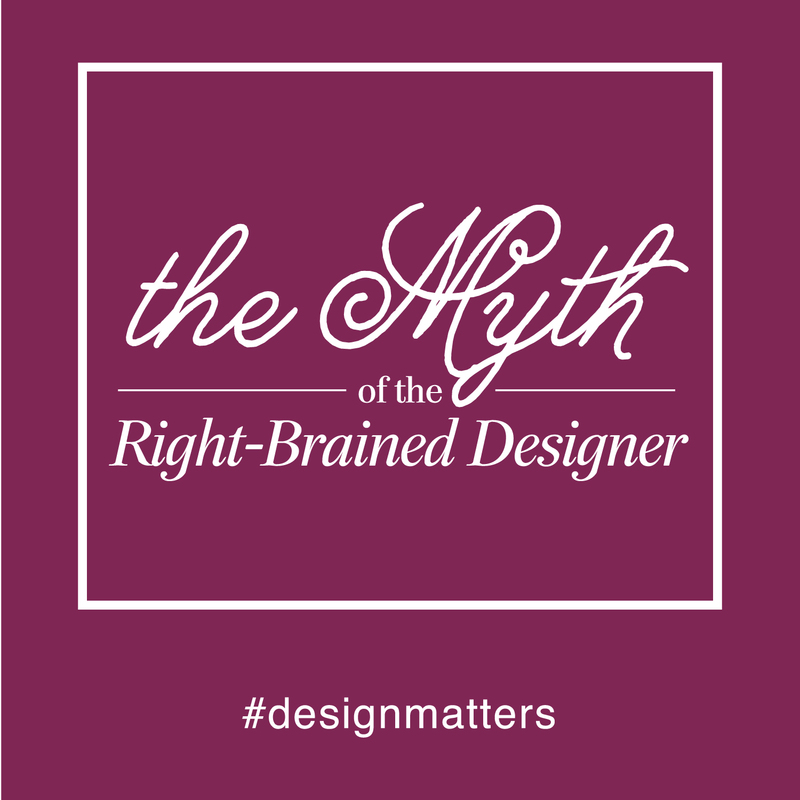 One of the most common misconceptions about designers is that we are just right-brained. Most people just see us as artists. I don’t mind people seeing me as an artist, generally speaking. It means they think I’m talented, and I’m usually okay with that, to a point. The problem comes when people interpret “artist” as meaning we design like a kid makes a finger painting, with nothing but free-spirited creative impulse. Any serious graphic designer knows this is a non-existent reality. When designers create something, its important to know the design process and how we use our left and right sides of our brain. If we don’t, we run the risk of turning creating for ourselves instead of designing with a “why” or purpose in mind. My 7-Step Design Process is a great way to explain how designers use their left brain and right brain. I hope that after you’ve read this post that you will be convinced that not only are you not only right-brained, but that you see the important role your left-brain has. If you have been following me for any time at all, you know that I am all about a creative process. This process includes discovery before creation; discovery about the client, the audience, the message, etc. this discovery, believe it or not, comes primarily by utilizing the left side of your brain. Of the 7 steps in my creative process, three of them are almost exclusively left brain functions, and another three require a strong use of the left side. After looking at all seven steps, SIX of those steps rely on using the left brain. From the very start of my [ever famous] process, the left brain is the very first thing that is engaged. The client meeting requires organization, speech and language skills, and logical processing in of the information you are receiving. Reading and understanding the design brief helps you take in facts and analyze the words on the page to come to an understanding of the information the client has given you. Once you have done all this, you’re thinking, okay, now I get to start creating, right? Wrong. Maybe more than any others, where you use your left-brain the most, is the research and brainstorming stage. During research and brainstorming is where I always say to use words first. The two most crucial stages to beginning any design project are research and brainstorming. Both of these require logic, language, sequencing, linear thought, and thinking in words. Obviously, research requires a lot of reading, about the client, about the target audience, etc. Research uses your left brain skills such as fact, linear thought, and logic. Research requires planning and being detail-oriented. These are all functions that reside on the left side of your brain. Then comes the most enjoyable part about the brainstorming phase for me, the mind map. Mind mapping also uses logic, linear thought, language, sequencing, thinking in words, and language-all left brain functions. The cool thing about mind mapping is that even though 90% of what you do involves the left side, the fact that you are using physical tools (pencil and paper) and creating abstract shapes, brings your right side into the process for the first time. The left side of our brain looks at all the parts of our research and brainstorming and works for us to make them into a cohesive whole, or idea. The brainstorming phase is where our two hemispheres first start to work together and it acts as a bridge from the logical to the creative. When we do a mind map and engage the left part of our brain using words, we also draw shapes, and use colors to highlight things and this engages the right side of our brain in doing these things we will figure out the perfect words to write that will eventually become our concept if we exhaust and empty our brains of the words we have. This may seem like a given but sketching falls into the right brain category exclusively. The skills that are used to sketch are primarily right-brain functions. Almost all of the words that you will find associated with the right side of the brain relate to what we as designers use when we sketch out design ideas. Words like creativity, feelings, visualization, intuition, imaging, daydreaming, artistic motor skills, imagination, and more. This is your time to let that wild artist loose. I wrote an entire post on sketching and how it relates to the design process that I suggest you read, especially if this is not already a part of your creative process. The rendering stage is the perfect mix of left and right sides. We should be using creativity, artistic (motor skills), intuition, imagination, and visualization, in conjunction with logic (what we know about our client and the audience), thinking in words (copy), and the analysis of our choices. Rendering is when we finally pickup the mouse and start to hunt for our fonts/type choices, where we browse for the best graphics and photography, and we utilize software to compose our designs. It is at this crucial stage that we not only create our designs, but where we begin to ask questions about the choices we are making and how they relate to the research we conducted and the design brief. This is where I believe so many designers come up short. I’ve written briefly before that designers need to “ask why”. This comes at every stage of decision making-it is a left brain function to ask why. The right brain doesn’t care why it likes it, it usually just feels good. But in graphic design, the left side of the brain is what keeps the right side in check. Presentation requires a re-evaluation of the motives and direction of the left brain and forces them to work together in ways that are sometimes really difficult. It is especially difficult for designers who have never been told that there should be a logic and reasoning behind all of their design decisions. Before you can present to your client you have to make sure that you can explain to them why you did what you did in a way that they can understand. This one also uses both sides because not only do you have to analyze all your “whys”, but you have to present your work in a visually appealing way-this requires your right brain. Whether it is a presentation via email or in a coffee shop or board room, you will have to organize a proper presentation and make it nice to look at and easy to understand. The finishing touches usually involve finessing your designs which is mostly the right brain. But if there are any major changes that the client requests, then you will have to bring your left brain on board to question the changes and answer accordingly with relevant design application. So again, you’ll see, that as graphic designers, we are required to use much more of our left brain at many different times throughout the process than you may have realized. Yes, as creatives, we are definitely “right brained”, but as graphic designers and creatives, we must exercise our left brains because that is that makes us unique in the creative fields. We are not fine artists who get to rely almost wholly on their right brain functions to create what feels best. It is our job to look at every step of our process logically and critically as well as aesthetically and intuitively to come up with the best version of our work. Design is a wonderful world, I hope you’ll join me here. Because design matters.